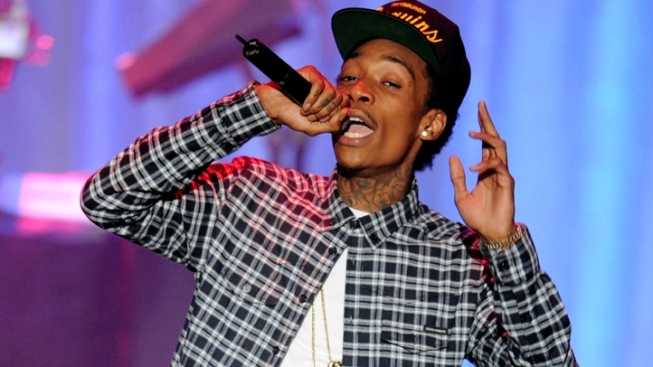 Saturday night's Wiz Khalifa show at Sleep Train Amphitheatre has been canceled. Saturday night's Wiz Khalifa show at Chula Vista's Sleep Train Amphitheatre in San Diego was canceled in the wake of a fatal shooting at Friday night's show at Shoreline Amphitheatre in Mountain View, Calif.
"Due to an active investigation at the Shoreline Amphitheatre stemming from an incident after last night's performance, tonight’s Under the Influence of Music Tour show in Chula Vista, Calif., has been canceled and will not be rescheduled. Ticket holders should return to the point of purchase for a refund. We abhor violence of any kind. We continue to cooperate with authorities in their investigation into last night's isolated incident, and any further inquiries need to be directed to the Mountain View Police. Fans who purchased [tickets] through LiveNation.com or Ticketmaster.com will be automatically refunded and do not need to take any further action. If you purchased tickets at the venue box office, you may return tickets for a full refund starting Monday, Aug. 25 from 10 a.m.-2 p.m. Refunds will be issued via the original method of payment."" Due to a situation out of our control, tonight’s UTIOM show is canceled. Mountain View police spokeswoman Shino Tanaka told The Associated Press that the shooting happened backstage at the popular Silicon Valley venue, where Pittsburgh rapper Wiz Khalifa performed Friday night. The unidentified 38-year-old man died at a local hospital Saturday after being shot multiple times during the show. Police rushed to the outdoor venue after receiving multiple calls that shots had been fired, but officers are still looking for a male suspect believed to be in his 20s. They are asking concertgoers for photos or videos that might provide clues. Tanaka told KTVU-TV that authorities didn't yet know how a gun made it into the amphitheatre, where patrons undergo security screening. The immensely popular rapper rose to prominence after hitting the Hot Rap Tracks charts in 2008 with his song "Say Yeah" and broke out worldwide after his 2010 single "Black and Yellow" hit No. 1 on the Billboard Hot 100 chart. His latest album, "Blacc Hollywood," was released on Aug. 19 and features guest appearances by Juicy J, Snoop Dogg, Rick Ross, Nas and Nicki Minaj.